Dr. Chugay uses soft Gore-Tex nasal implants in nose sculpting surgery for certain types of secondary cosmetic and reconstructive rhinoplasty. These instances include augmentation of the nasal bridge or filling in concave deformities, often found in asymmetrical, injured or misshapen noses. These nasal implants (nose sculpting) produce a natural appearance of the nose, smooth contours, which usually cannot be achieved (regardless of the surgeon’s skill and good will) with cartilage grafts or other natural or synthetic implants or fillers. For some instances of reconstructive rhinoplasty, Dr. Chugay uses cartilage grafts. Dr. Chugay believes that use of cartilage grafts should be limited to only certain instances in reconstructive rhinoplasty. Cartilage grafts are pieces of patient’s natural cartilage material (from nose or ear), which are placed in the patient’s nose. Once the cartilage graft is fully healed and assimilated, the results are excellent. However, in many cases of nose sculpting surgery, cartilage grafts have a tendency to move, absorb or extrude. Use of Gore-Tex is not only viable, but a superior alternative to cartilage grafts in most cases. Gore-Tex is a very new effective implant material. It has undergone extensive testing. It is inert and safe for patients use and has been approved by the FDA for surgical use..
Dr. Chugay has found that cartilage grafts produce an excellent reconstructive result in the case of patients requiring nasal tip reconstruction. When the nose has been damaged, in previous surgeries or traumatic injuries, to such an extent that a major nasal tip correction is required, cartilage grafts are sutured into the nasal tip to reconstruct the tip. This is a rare and unique procedure which requires enormous skill on the part of the surgeon. Because of its complexity, open rhinoplasty surgery is performed to access the nasal tip. Frequently, correction of septal deformities will allow for straightening of crooked noses. Occasionally a conservative reduction of most of the septum is the only effective solution to straighten out a severely misshapen nose. Such reduction of septal cartilage (inner barrier between the nostrils) is a fundamental revolution in rhinoplasty technique allowing for correction of previously thought-of-impossible nasal deformities. Such nose sculpting surgery of septal reduction, nevertheless, preserves the tip support. Dr. Chugay, in the United States, and Dr. Jose Juri, in Argentina, have popularized this technique. 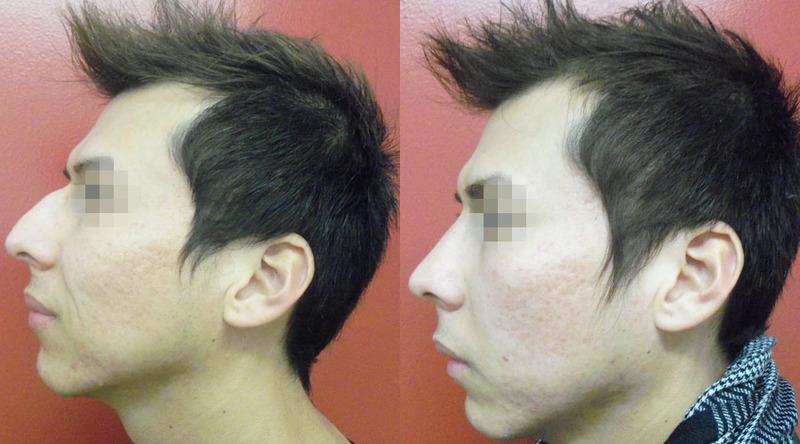 Who should Perform Reconstructive or Secondary Rhinoplasty? Successful Reconstructive or Secondary Rhinoplasty (nose sculpting surgery) is limited to a handful of highly skilled surgeons. Make sure that your surgeon has experience in these procedures. Only about 5% of surgeons in the United States are familiar with and use Gore-Tex implants. The surgery will be performed in our fully accredited surgical facility on an outpatient basis. No inpatient stay is required. Nose surgery is not without its risks. The potential risks include but are not limited to: infection, bleeding, scarring, nasal deformity, and difficulty breathing. Following the surgery, the nose will be placed in a cast to allow the area to heal free from external damage. The cast will be removed on your post-operative visit. There will be swelling in the area and breathing may be difficult post-operatively; however, as the swelling decreases you should notice a dramatic change in ease of breathing.